Paprika is a spice powder made from drying and then grinding the pods of several different types of Capsicum annuum peppers (and in Hungarian the word paprika, confusingly, also refers to the peppers themselves). 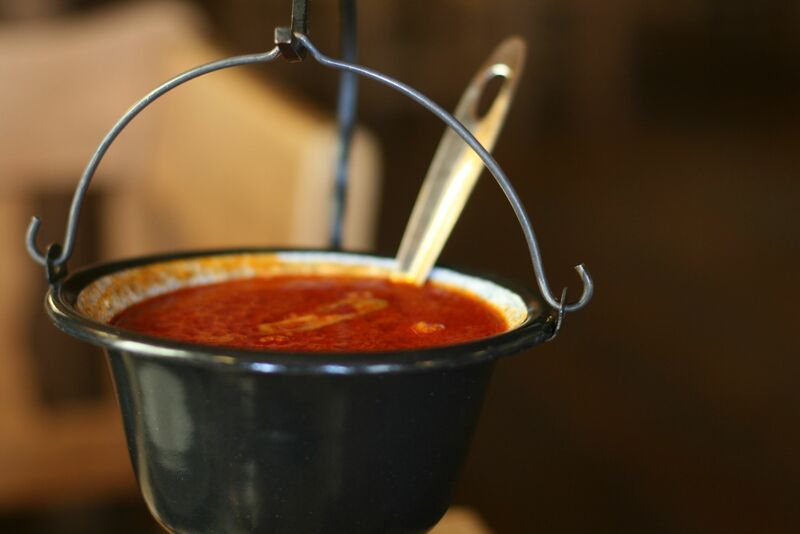 Most commercial paprika comes from southern Hungary, particularly around the towns of Szeged and Kalocsa, and it comes in a range of sweetness/heat levels and coarseness. Visiting one of these paprika manufacturers during processing time will leave you smelling of paprika long after you have left the place. Though there are four different official grades of Hungarian paprika, most cooks do not pay attention to these grades. 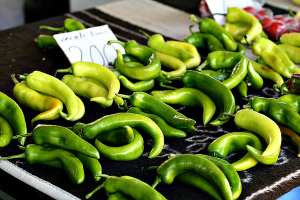 Rather, they look for a fresh paprika from a trusted producer, with a strong peppery aroma and an intense color. The best paprika is intensely colored, from deep reddish brown to bright orange. 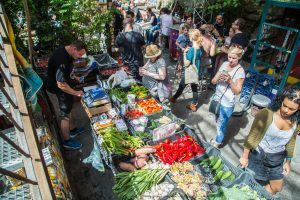 If you are buying homemade paprika at the market (which usually is sold in half-kilogram unlabeled plastic bags), it will simply be édes (sweet) or csipős (hot). But elsewhere you may encounter különleges (“special”), the most finely ground, brightest red paprika, which can be sweet or mild; csemege (“gourmet”), a light red, slightly coarse paprika, which can be hot or mild; édesnemes (“noble”), a light red, coarser paprika; and rózsa (“rose”), a dark red, medium-coarse paprika, which tends to be very hot. Paprika is an everyday ingredient in the Hungarian kitchen and it is used in abundance, though in a thoroughly different way than it is typically used in the US. 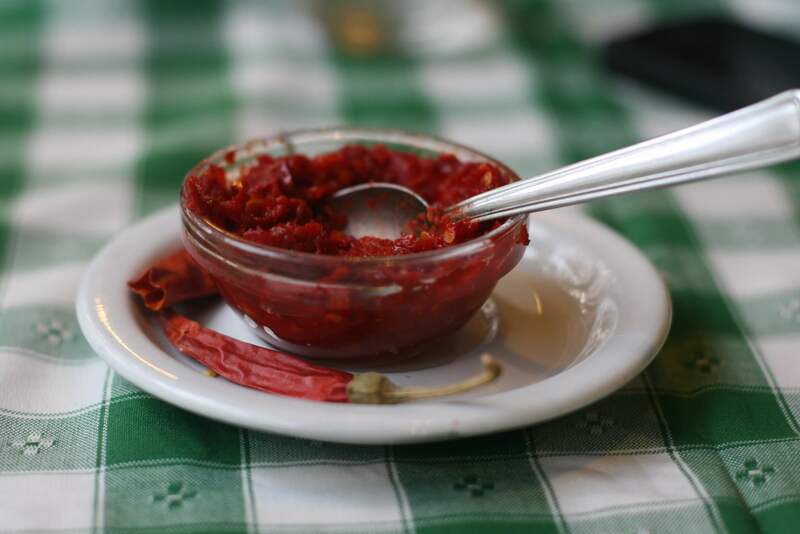 In Hungary, nearly all dishes are prepared with sweet paprika. 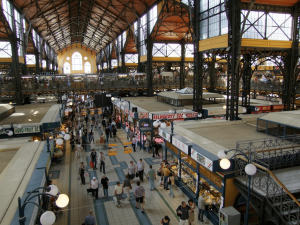 If there’s a single Hungarian cooking technique that summarizes Hungarian cooking, it is that adding paprika (and not just a pinch, rather several heaping tablespoons) to diced onions which have been slowly sautéing in hot fat until they are clear (but never browned), will produce the most definitive Hungarian flavor, adding depth and complexity. 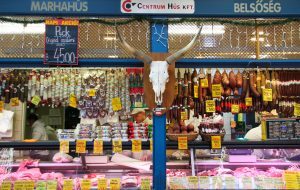 “Somewhere along the line the Hungarians hit on the holy trinity of lard, onion and pure ground paprika,” writes Lang. To best bring out the full flavor in paprika, it must be added to the hot fat (in generous amounts) and heated very briefly (to prevent the bitterness that occurs when it burns) before adding the rest of the ingredients. 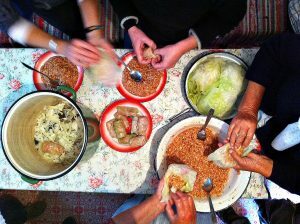 This cooking method is the first step to countless Hungarian dishes. 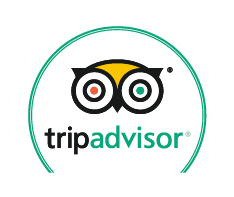 A little bowl or shaker of paprika sits next to the salt and pepper on any proper Hungarian dining table … in case you need an extra dose. Sprinkling paprika on a cold dish will add little depth, but it is also essential to a few cold dishes. 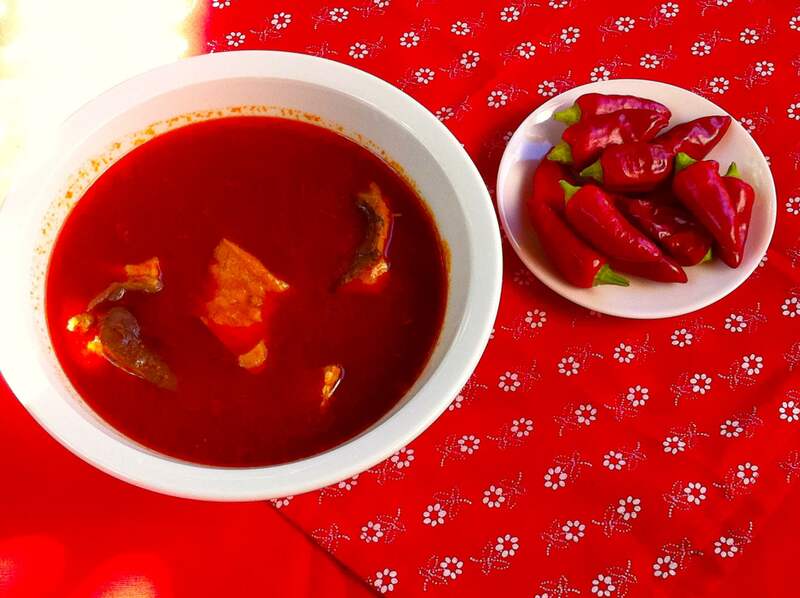 For example, paprika is sprinkled on top of thick slices of bread smeared with lard and red onions (called zsíros kenyér), on top of cold foie gras (liba maj), or devilled eggs (kaszinótojás). It is also the defining ingredient in körözött (Liptauer), the dip made from curd cheese, onions and caraway seeds. 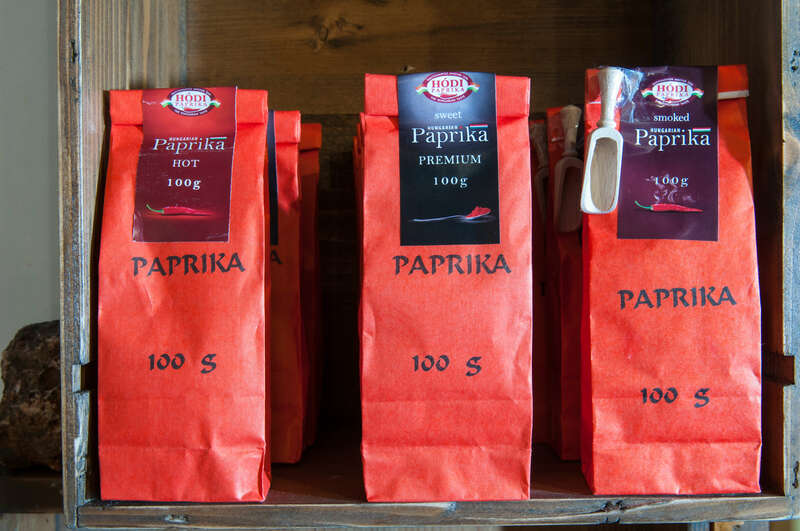 In fact, in Hungary, paprika can be added to just about anything … which explains why when you buy a half-kilogram bag of paprika you don’t have to think twice about how to use it. 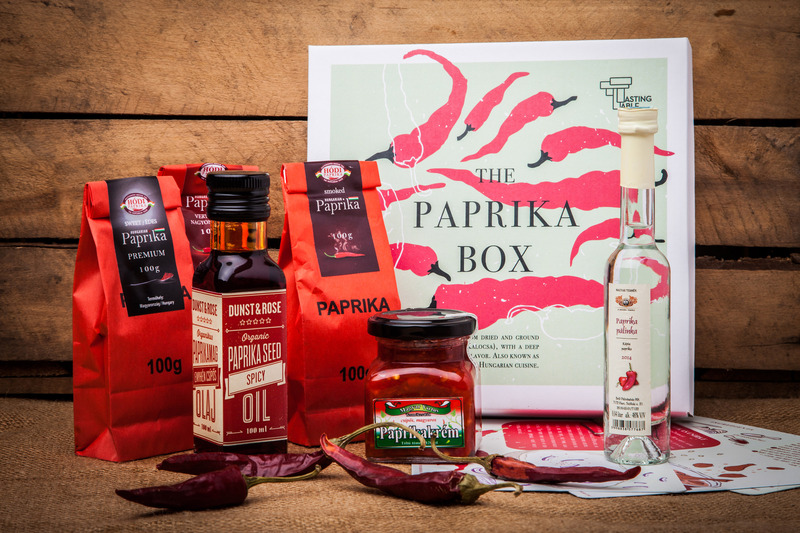 This paprika box—which holds a range of paprika products, from paste to pálinka—is available at The Tasting Table. 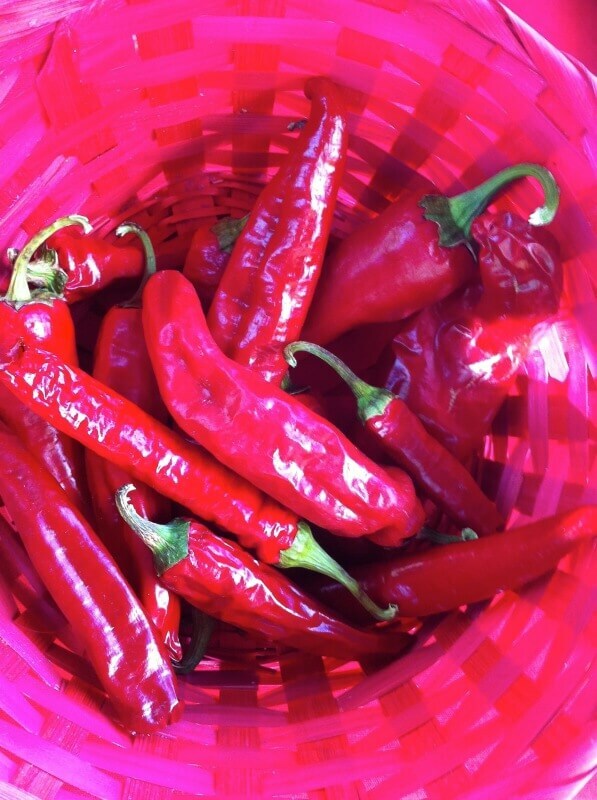 Learn about paprika on Taste Hungary’s Culinary Walk and Culinary Walk: Sunday Edition!